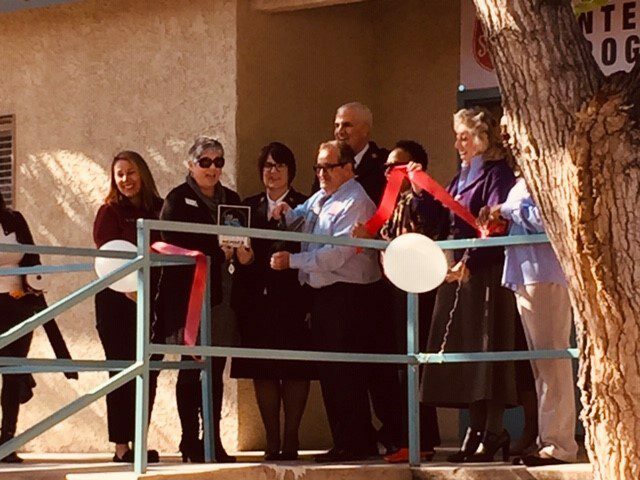 The Salvation Army Southern Nevada Veterans Services Program opened a new facility Nov. 9 to accommodate 42 formerly homeless veterans participating in the Community Integration Program. Veterans Services Program Coordinator Nick Lenderman cut the ribbon on the newly rehabbed building, which was made possible by a grant and volunteer hours from the Home Depot Foundation. Alson on hand were Majors Cheryl and Randy Kinnamon, Clark County Commanders; Congresswoman Dina Titus; Kelly Woods, Las Vegas City Councilman Cedric Crear’s representative; and Lisa Hewitt from the Veterans Administration. The program is designed to prepare veterans for independent living and offers case management, assisting in obtaining benefits, life skills training, group work, placement in rehabilitation when necessary, transportation to appointments and more. Participants are able to stay in the program for up to 24 months, though many complete and move on within six months. The 42 beds, combined with the other 53 for additional programs, brings the total number of veterans housed on the Homeless Services campus to 95. Home Depot Foundation employees painted, laid new flooring and updated kitchen areas within the facility. Additional donations from the community allowed purchase of new furnishings, a security system and other necessary equipment. The ribbon cutting was made possible by the Las Vegas Chamber of Commerce. The event was covered by Fox 5 with a recorded story and interviews and by KLAS, Channel 3, doing a story with photos for the website.